There is nothing more contagious than the exuberance of youth. Airy and spirited, weanlings can be compared to adolescents; highs and lows in abundance. Living in the moment is assured. It has been said that adolescence is like having only enough light to see the step directly in front of you; I think that is applicable to adolescent horses as well. This young filly is the very picture of youth and joy, she remains ever willing to see the possibilities in any situation. Charge right in, make a ruckus, consider the consequences after the fact, it’s the way of youth. 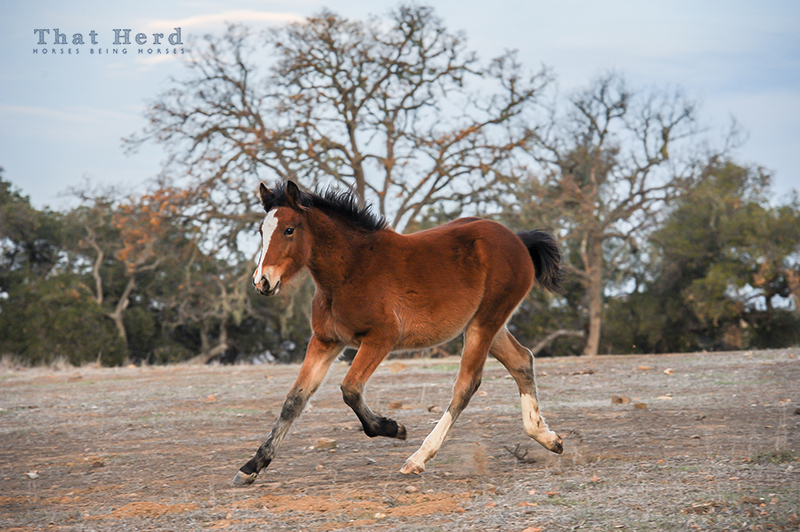 Furry and frisky, a weanling filly demonstrates the exuberance of youth. Thanks for following your passion and sharing these beautiful photos of these amazing animals.